Get the best bike locks and bike accessories for your next adventure at Walmart Canada. Spring is right around the corner, and that means it’s time to get those bikes out of storage in preparation for your next journey. Cycling is a great way to inject more sports and recreation into your lifestyle this year. Before you hit the streets or the trails, you’ll want to make sure you have a lock to properly secure your bike. Also, there’s no shortage of bike accessories available to help prepare you for anything you encounter on your treks! Keeping your bike safe is essential. We all lead busy lives and if you have to run an errand, make sure you secure your bike with a lock. Bell Sports’ Ballistic 500 is an efficient and simple-to-use solution. With its flexible steel cable design, you can thread it through your bike’s frame, rear wheel, and bike rack. Included are one standard key and one lighted key, with free standard key replacement through Bell Sports. For extra protection, the Ballistic 500 has a hard steel sleeve covering the braided steel cable. Both the sleeve and cable help prevent sawing or cutting. Locks that are built strong are a deterrent for bike thieves! Another security option is Bell Sports’ Catalyst 300 lock. This U-shape lock is made of tough 12 mm hardened steel, so cutting through it is no easy task. Typically, U-shaped locks are used to securely lock your bike’s frame to a bike rack. The Catalyst 300 comes with two keys, so if you ever lose one you’ll have a backup. Not only does the Catalyst 300’s U-shape locks have a hard exterior, but it also features a vinyl finish to help protect your bike from scratches. Keeping yourself safe while biking at night or during periods of low visibility is extremely important. To help you see at night, and illuminate yourself to drivers and pedestrians, I recommend a battery-operated light set. Bell Sports’ Lumina 750 set comes with a light for the tail end of your bike as well as the front. Choose between a steady or a strobe light effect on the rear light to catch traffic’s attention. The front light reaches a bright 150-lumens to keep you aware of what’s in front of you. Cycling is a great activity for those young or old! Families with young children can take them along for the ride using a secure bike trailer. Allen Sports’ 2 Child Bike Trailer attaches to the rear of your bike and provides a comfortable, secure ride for your young ones. Whether rain or snow, your child has protection behind the trailer’s four-season cover. On sunny days, roll up the cover for ventilation, and on cold days, close the cover to get the warmth inside. When not in use, the trailer can be folded up and stored, reducing clutter in your garage! Don’t be caught in a precarious situation again while riding your bike! Whether you’re on a trail or riding across the city, getting a flat tire is the worst. 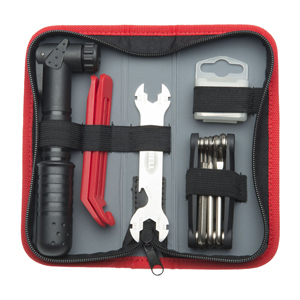 The Roadside 900 Repair Kit is the ideal companion to bring along on all your trips. Mount it on your bike and you’ll have instant access to the kit’s bike pump and glue-less patches for your tires. You’ll also receive a multi-function wrench, two spoke wrenches, and a multi-function tool complete with an assortment of hex keys and screwdriver heads. No matter the scenario, you’ll have the means to fix your bike and resume your adventure! Wallet? Check. Phone? Check. Keys? Check. Sooner or later, you’re going to run out of pockets! That’s why a small bike bag is great to have so you don’t worry about what you’re carrying. Keep your small items in a conveniently located bag attached to the frame of your bike. The PRO Cycle Bicycle Triangle Storage Bag easily straps to the underside of your bike’s frame. The bag is water resistant, so you won’t have to worry about your phone when caught in the rain. If you often cycle on trails, you’ll be happy to know the bag can endure hills and bumpy terrain. Before you take your bike out this spring, make sure your tires are full of air. A straightforward, manual bike pump is essential. The Bell Sports Air Attack pump has a built-in gauge, letting you know when your tires are at capacity. Delivering a maximum of 100 PSI, this pump can have you ready to go with little effort. Once you’ve had your fun for the day, having a storage space for your bike can keep you organized. This innovative Bike Nook bike stand eliminates the need to lift your bike onto a hanging bike rack and saves floor space. Roll your bike into the stand, tilt the bike forwards, and lock it in vertically—it’s that simple. The Bike Nook stand fits any bike model with wheels 18” (46 cm) and bigger! Finally, keeping safety in mind on any bike trip, helmets are very important. We’ve all heard the lectures, and truth be told—helmets do save lives. A simple, comfortable helmet to wear is all you need. The Bell Sports Adult Rig Helmet is a sleek model that has a pinch guard buckle, protecting your fingers and chin. Ventilation holes help your head breathe for more comfort during long rides. The helmet also features a visor to help keep wind and debris out of your eyes. Be ready to run errands or hit the trails this year with the best locks and accessories. For a variety of lifestyles, there are many bike accessories available to make your next trek fun, safe, and memorable.